I don't read many short stories as I prefer the character development in a novel but when I saw this book of short stories by one of my favorite authors, I decided to give it a try and I wasn't disappointed. This was an interesting book of short stories by a fantastic author. The first story, "Paris for One", is the length of a novella and the additional 8 are short stories. As with any short story collection, there were some that I really liked and others not so much. Instead of being all about 'happily ever after', these stories were a more realistic portrayal of life -- some had happy endings and some didn't but they were all about women and how they handled their lives and their marriages. My favorite was "Paris for One". 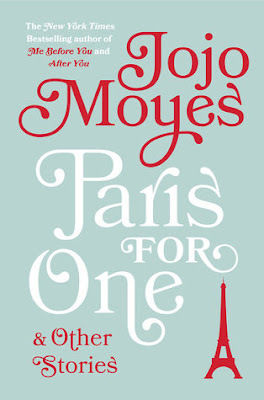 Nell, a shy English girl, plans her first trip to Paris with her boyfriend - who doesn't show up. Nell can either take the first train back home, stay in her hotel or go out and experience Paris. She decides to go out and enjoy Paris and when her boyfriend finally shows up, she has to decide whether she wants to go back to her normal life or learn to live life more fully using her experiences in Paris as the beginning of her changed life. Her choices completely change her life and she is a different person at the end of the story. Read these short stories if you'd like a glimpse of the author's wonderful writing and then order one of her novels to find the wonderful characters she creates. Thirteen Days with John C.
I haven't read any of Moyes' work yet, but I did enjoy the movie 'Me Before You'. I think I'll give this book a try - adding it to my reading list! I also haven't read her (it's harder to fit the TBRs in while also writing!) but I like this idea. As I wrap up the second decade of my own marriage, I like the idea of "real" relationships. Adding to my ever-expanding TBRs!